The Garmin GPSMAP 64st is a straightforward, easy-to-use handheld GPS system for the avid hiker, but be ready to pay a premium for simplicity. While many of us may be more familiar with Garmin as the navigational artifact of yesteryear, dedicated GPS units are increasingly popular among avid hikers who'd prefer to leave stash their phones during a hike. The GPSMAP 64st is one such device for avid hikers, offering an easy-to-use interface and long battery life. We took the Garmin GPSMAP 64st to the Pacific Northwest where we gave the beefy handheld device a proper trial along the scenic slopes of the Tualatin. At more than six inches in length, 2.4 inches in width, and more than half a pound in weight when fully loaded with batteries, the GPSMAP 64st has a rather clunky build with the aesthetic of an old-school walkie-talkie. Regardless, the unit fits ergonomically in the palm of the hand and the rubberized exterior and textured ridges give it a comfortable, non-slip finish. The GPSMAP 64st comes with a carabiner to easily strap to a backpack or to a jean back pocket for when you’re not using it. While the Garmin GPSMAP 64st may not be taking home prizes for revolutionary design, the product has a functional focus an outdoors enthusiast can easily appreciate. For example, with an IPX7 rating, the GPSMAP 64st is suited for use in the rain, snow, and can even withstand submersion in water up to one meter in depth for up to 30 minutes. Meaning this GPS system should be able to take an accidental soak in a shallow stream without leaving hikers high and dry. You control the GPSMAP 64st using a series of buttons and a square directional keypad. The simple keypad is wonderfully easy-to-use, but it does take a while to get used to before navigating the system becomes second nature. The lack of LED buttons can also make it frustrating to use the device in the dark, although the backlit screen does dish out enough lumens to get the job done. The buttons do give the device a utilitarian look in the touchscreen era, however, these too add trail merit and all-weather functionality making it easy to navigate the system even while wearing a thick pair of gloves. While [it] may not be taking home prizes for revolutionary design, the product has a functional focus an outdoors enthusiast can easily appreciate. To make room for the keypad and buttons on the face of the device, Garmin had to greatly sacrifice screen size with GPSMAP 64st. At just 1.43 inches by 2.15 inches, this rather small display is sufficient, although it does make things feel a bit cramped at times. It’s fairly safe to say that most individuals have used a Garmin GPS in some form. From a user-experience perspective, the GPSMAP 64st is a nostalgic trip down memory lane. The device uses virtually the exact platform as the classic Garmin dashboard GPS systems down to the hallmark icons. Garmin certainly has taken the “if it isn’t broke, don’t fix it” approach to its user interface, and this lack of frills makes it easy to pick up on the fly and navigate right out of the box. The GPSMAP 64st has a fairly straightforward setup process and it just takes a few minutes to have the device up and running as a basic GPS, however, setting up some of the more advanced features can be a bit of a pain. The device can be powered by a pair of AA batteries or a rechargeable NiMH (nickel metal hybrid) battery pack. Both of these options are sold separately. It just takes a few minutes to have the device up and running as a basic GPS, however, setting up some of the more advanced features can be a bit of a pain. Ultimately, we went with the classic AA battery route, although the unit does come with a USB cable if you choose the rechargeable battery pack option. Once the device is juiced, it takes about one minute to acquire satellites before the device is roadworthy, but making the device trail-worthy takes a little more time. To set itself apart in a world brimming with navigation apps as well as other GPS systems, Garmin goes all-in on its BaseCamp software and BirdsEye Satellite Imagery capacity. At times, the GPSMAP 64st just seems like a way of forcing the lackluster BaseCamp software on the user, but it is a necessary evil to fully utilize the device. Fortunately, the Garmin Support Page has an extensive series of tutorials videos to help you with everything from installing outdoor maps to transferring data to the device. Despite being dated, BaseCamp gives adventurers access to high-resolution, color maps (TOPO 100K, TOPO 24K, etc.) with helpful trip planning tools and outdoor features to make the most of any outing. However, you’ll need computer access to download these high-resolution, colored maps. Once the BaseCamp program is installed, you can zoom in on a prospective adventure, crop the area, and then choose the quality of the map. Remember, higher quality maps have more data than lower quality maps and this will limit the size of the area you’re able to download at once. This means you may need to download multiple high-resolution maps to cover larger areas or settle for larger lower quality maps for the sake of convenience and storage. Once these maps are downloaded you can import this data to the GPSMAP 64st 8 GB internal memory or drag the file to a microSD card (sold separately). Remember, the GPSMAP 64st comes with a one-year free subscription to BirdsEye, however, after the end of this period you’ll need to renew the subscription for $29. This very much feels like a dedicated devices version of a “free app” with gotcha in-app purchases. 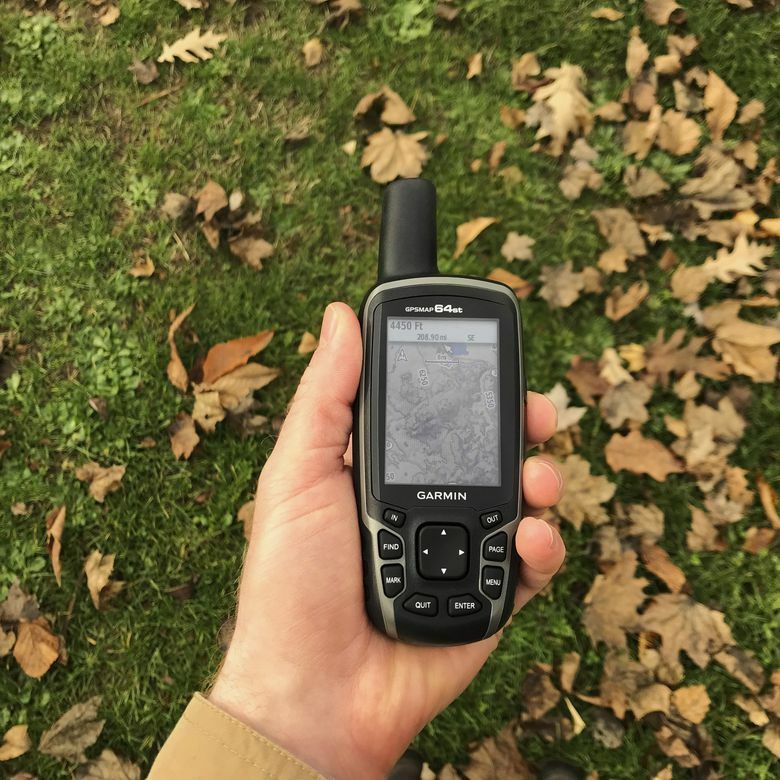 Finally, to minimize the need to dig your phone out of your backpack while on the trail, it’s possible to synch the GPSMAP 64st and phone via Bluetooth to easily share location information, read text messages, and receive those ever-important Instagram notifications. You’ll need computer access to download high-resolution colored maps. When it comes to gauging a handheld GPS, nothing is more imperative than signal, battery life, and accuracy. Garmin claims the GPSMAP 64st has a 16-hour battery life, and while manufacturer's estimates are typically rather optimistic — if not all out deceptively optimistic — based on our tests, the battery life expectations hold up. With continual usage and intermittent check-ins for updates, we drained roughly half of the battery in about 7 hours. On our outing, the GPS signal never dipped below three bars (even at higher elevations). The preloaded TOPO 100K maps were crisp and clear and it only took us a few moments to realize the GPSMAP 64st isn’t your classic grocery-getter Garmin — even if the user interface hasn’t changed in years. The GPSMAP 64st also touts plenty of bonus features worthy of note. The Tracks feature acts as a stored series of digital breadcrumbs from each of your adventures enabling users to easily retrace their steps. BaseCamp allows users to check the elevation of a specific point as well as retroactively alter a favorite hike and share this information with a friend. For some reason, Garmin really pushes the included Geocaching capability and seeing as we were in Oregon, the state where Geocaching began, we couldn’t help but partake in this unnecessary, albeit enjoyable, bonus feature. The GPSMAP 64st comes with more than 250,000 preloaded geocaches and with just a few clicks we had access to local caches around the Portland Metro area with names such as Haunted Crypt, J.C. Pennies III, Bus Stop 4, Big Gulp Cup, and Kenny’s Sacrifice. What treasures remain to be discovered at these sites? Who’s to say? And that’s half the fun. Currently, Garmin is selling the GPSMAP 64st for $349 although the product is available on Amazon for substantially less at least at the time of this writing. Nonetheless, dropping this amount is certainly a large investment, but a premium handheld GPS with a touchscreen and larger display will increase the price by hundreds of dollars rather quickly. As is the case with any niche-specific product, it’s important to determine which specs are necessary for a typical outing. If your needs aren’t too demanding, the Garmin GPSMAP 64st is more than sufficient to get you home safe from a hike. To say Garmin has a bit of a corner on the GPS market at the moment would be an understatement. In fact, it’s not even close and the competition is essentially an intra-Garmin family feud. Finding the right product comes down to finding the right balance of price and functionality to meet your needs, and every outdoor enthusiast will have their own preferences to consider. Do you really need that onboard camera as well as the touchscreen display, or will a basic hiking GPS do the trick? For a navigational juxtaposition's sake, the touchscreen 8G Montana 680t with an 8-megapixel camera is currently priced at $599. The Montana 680t has a much larger screen measuring two inches in width and 3.5 inches in height but is also significantly heftier than the 64st weighing nearly 12 ounces when loaded with three AA batteries. At the more affordable end of the spectrum, Garmin is currently offering the 4GB GPSMAP 64 for about $250. Interested in seeing other options? Read our list of the best handheld GPS trackers on the market now. A worthy trail mate and welcome multitool. Casual hikers may not need the ample internal storage, however, more avid outdoor enthusiasts will appreciate the increased room for higher quality topological maps. As for casual campers, these individuals may be more than satisfied left to their own devices and a basic hiking app. Product Dimensions 2.4 x 6.3 x 1.4 in.